• Linking to sales threads in the Dealers Forum and Manufacturers Forum is permitted in this forum. However links to Dealer's or Manufacturer's websites or other sellers outside of the CPF Forums will NOT be permitted in this forum and such links stand to be removed by a moderator. Persistent violations of this policy may result in the loss of posting privileges. •Please browse through the threads that have already been posted in this forum to see if your question has already been addressed before starting a new thread. It's awesome that lights are getting brighter every year, but the fiddliness that comes from the on/off switch having to do double duty is a huge step backwards IMO. The Streamlight Protac 1L-1AA has everything you are looking for and not too expensive, it can be programmed to High only, 150 lumens on 1AA. It's a pretty good light, I EDC'd mine for about 18 months before I switched to a better light, had no issues during that time and I still carry it as a backup in my bag. They are both 1AA and single mode, tailcap switches. Tailcap switch and with mode switch on the side, never touch the side button and it will be left in the output that you set. At least you have some options with the output levels with this light. Last edited by GoVegan; 04-15-2019 at 06:23 AM. - I don't make fanboy recommendations, if I recommend a light it's because it's the most practical option for your intended application. - Whatever light you carry, no keychain should be without a Photon Micro-Light II. Sounds like the Fenix LD12 (might go with the LD22 instead) is what I'm looking for. Thanks! The Thrunite Archer, Fenix LD12, and several others have the power switch on the tail and the mode switch on the side, with mode memory. That's effectively single-mode if you don't press the mode switch while it's on. I can second the HP1 as a great cheap option... this is about $7.60 on Amazon right now and I have yet to find a better 1xAA single-mode tail clicky for that price. I've bought 5 of them for family members so far, they've been surprisingly good for the money. If you want to spend more, the others listed in this thread are also good of course, and I'd add that you consider the Streamlight Protac 1AAA 88049 too -- it's obviously not AA, but it's a great little robust AAA that is larger than many AAA flashlights and rotates in with my AA flashlights just fine, and is honestly one of my favorites in its general size category. It's about as long as some AA EDCs, but a little thinner and programmable to meet your single mode requirements like its bigger AA Protac brother. It has a dual-mode that is super-useful too. You could use Eagletac AA with the head tight you will always get high mode. Anyone have experience with the Nitecore MT1A/MT2A? It looks like the tailcap switch is full power only with the bezel fully screwed down, which is good enough for me. Looks/price/availability look appealing. I haven't figured out how that UI is supposed to work. The one that I have can give High or Strobe when tight and that is not a surprise that I like at all. You are right the Eagletac D25 will enter strobe if tapped 2 times. I use it without issue. I like that I have high and with a twist I can have low. Unless what you want is a single mode light. I like a light like this also. I have a D3A, which is identical electronically to the Eagletac D25 Mk II. It has turbo and strobe, and then you have to twist the head to access all the other modes. You have to half press to get to strobe once on, so it’s a pretty good compromise, as it’s difficult to accidentally activate strobe. The nice thing is you can access the other modes when you need them, and they do come in handy. Yeah I really like mine too but this is not what the O. P. says that he is looking for,in fact it reads to me that this is why he wants a single mode light! I hear you,this is sadly true. 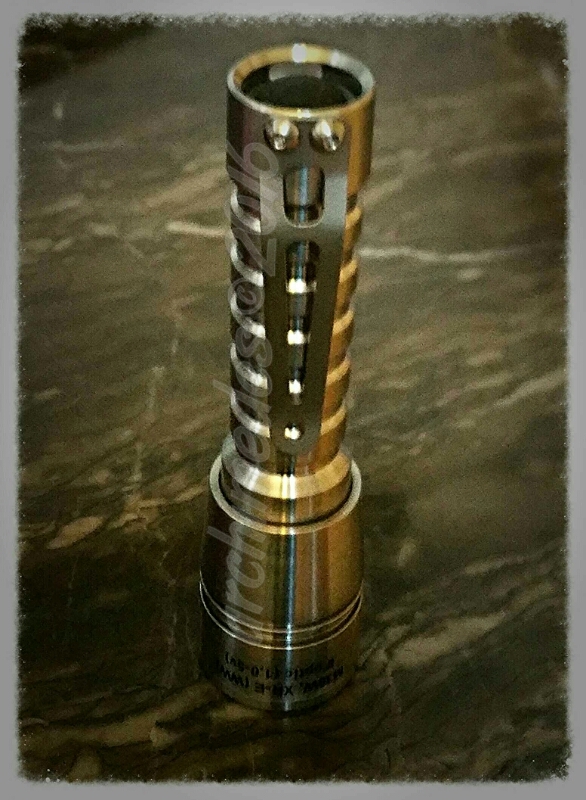 Malkoff MDC 1xAA tube + VME bezel + dropin of choice ? It is a single AA, single mode torch. I think this one is currently hosting an M30WF, but something similar could be done with the modern range of M31 series dropins. Last edited by archimedes; 04-16-2019 at 12:02 PM. Thanks for the suggestions, everyone. I ended up going with the Nitecore MT2A (2xAA instead of 1xAA, but the MT1A would have been pretty much the same). What I really like about it is with the bezel screwed fully down it **ONLY** turns on and off with the tailcap switch, and the "user-defined mode" you access by loosening the bezel remembers what mode you used last. That means if you carry it with the bezel always screwed down it won't ever shift modes on you, but you can still access other modes by loosening the bezel. (I would frankly like to see strobe/sos/etc. modes banned by law from all flashlights though, but good luck with that. The gimmicky modes are here to stay because they cost nothing to add.) The Eagletac looked appealling at first, but having strobe mode accessible from max output mode would have pissed me right off. Also that Malkoff MDC looks great and might well be my next light. (I've no fear of modding. Although the one downside of the MT1A/MT2A is that they've apparently got tons of red loctite on the threads inside the bezel. Boo. Didn't see this thread previously but I might have suggested the Sunwayman R15A -single mode, single AA, tail clicky, 90 Lumens and on sale now at Battery Junction. I don't own one though and can't vouch. I came across it while I was searching for a similarly configured host for a mod. Nitecore MT2A (and MT1A) sounds like a great light for its simplicity. Last edited by pc_light; 04-20-2019 at 12:58 PM.